Although I'd sent them in as two separate entries, Curt combined them into a single post last night. 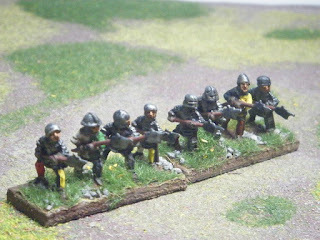 My 44 Norman infantry scored me 242 points, whipping me past Ray, JohnM and IanW into 5th spot behind Fran. So, here you go with the pics! 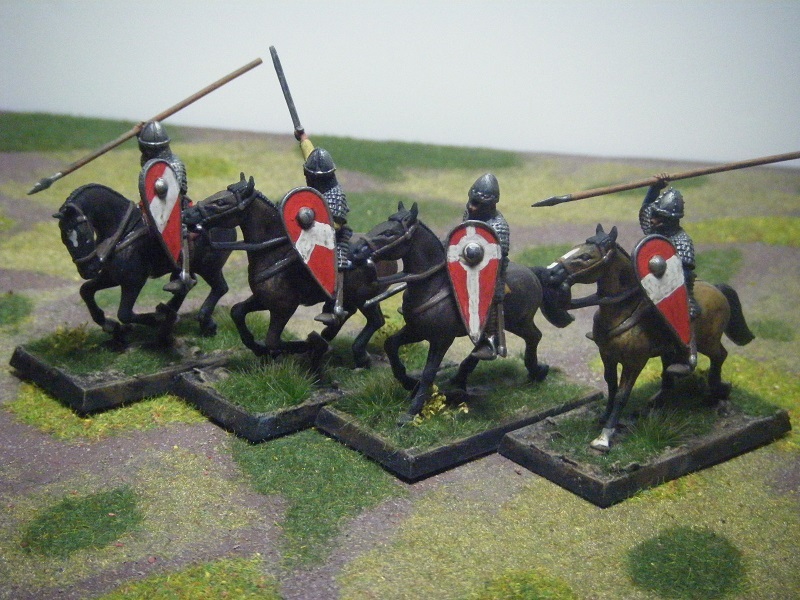 The sergeants have the same shield designs as the mounted knights I'd done previously - well, any knight who could afford to go mounted to battle with his lord would surely be expected to bring a couple of foot soldiers as well. The figures I prepped yesterday have been rinsed, dried and glued onto painting sticks. I just need to glue the pikes into their hands now, and riders onto horses (figures for the command stands were in that batch). I'll probably be able to prime them tomorrow evening. Today I've carried on with figure prep. I've fully prepped 36 pikemen so far and have another 32 that just need to have their hands drilled. 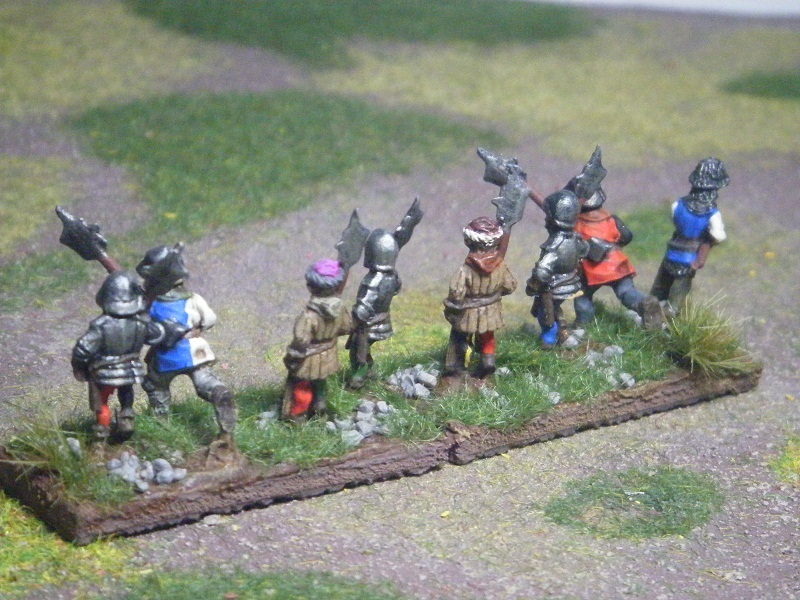 The 120 unarmoured pikemen have had their bases filed flat, so they will just need to have any flash/mould-lines cleaned up and their hands drilled. 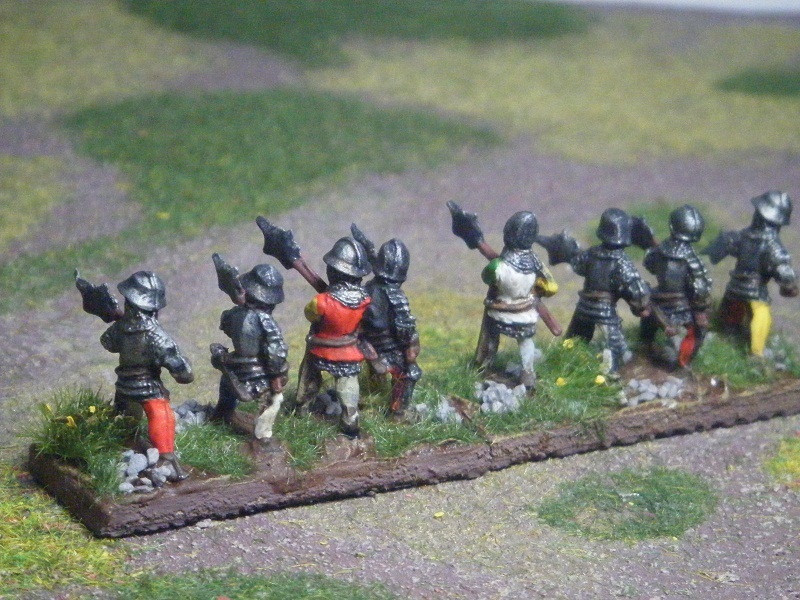 If I really push on with prepping and priming, I should be able to start painting the pikemen this weekend. 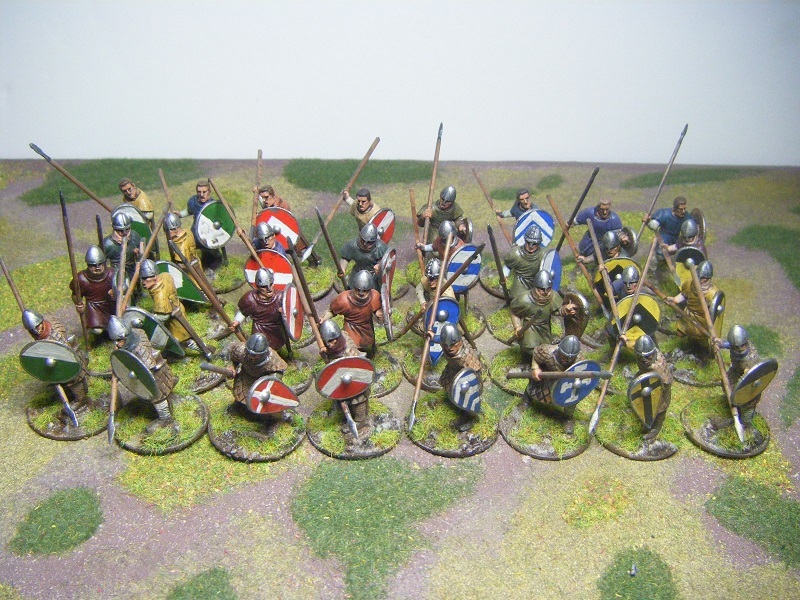 Now, you could call me crazy, but I've got this slightly mad idea of trying to paint up all 256 pikemen for my 8 pike units in one go. That would take me well past my 1600 point revised target. If it looks as though I won't make it in time, I can always scale back on the number I'm doing. 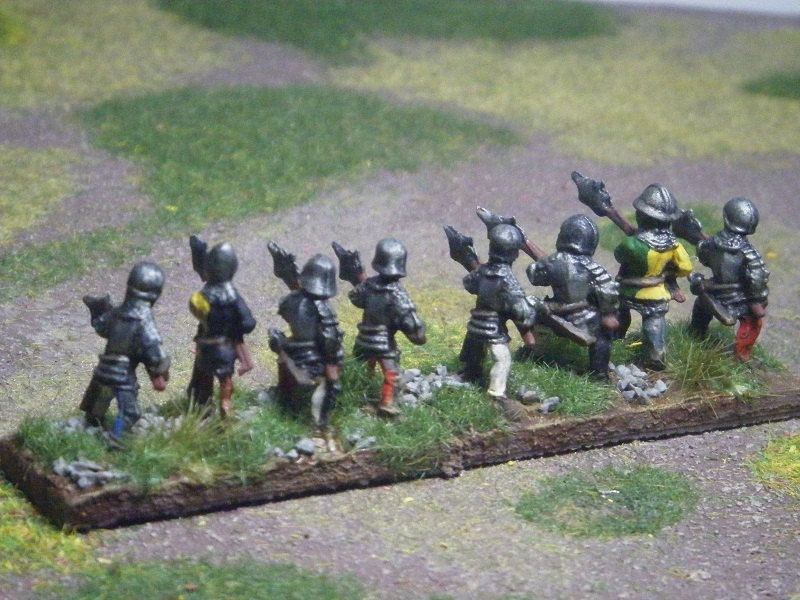 The 23 Swiss pikemen I forgot to order have arrived! 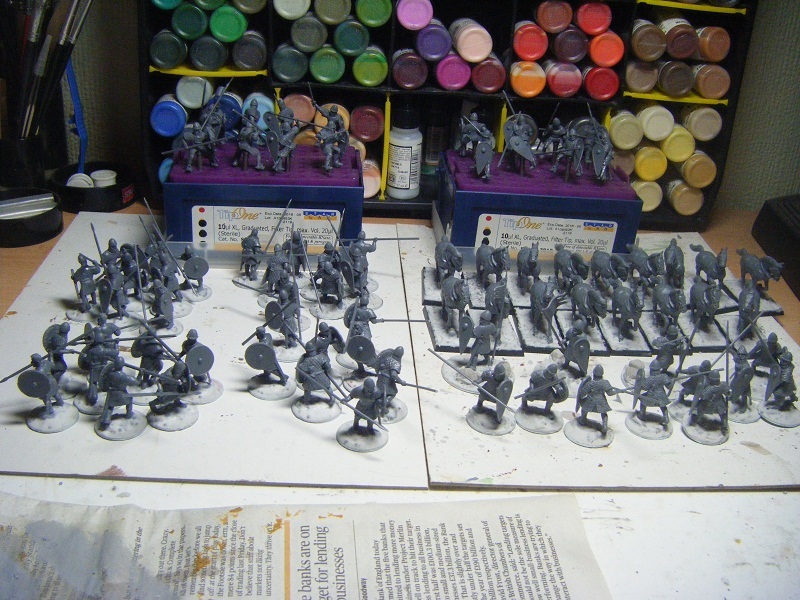 I really must crack on and get them all prepped and primed, ready for painting. There were a couple of other bits that I ordered at the same time in the packet, but my lips are sealed for the moment. 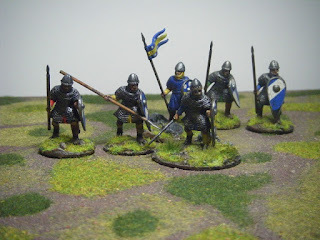 And my Norman infantry have been posted on Curt's blog. 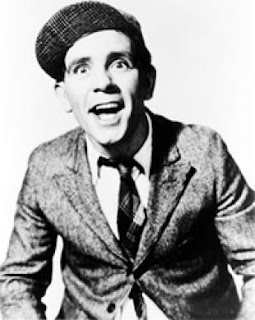 Whoopee! I've gained a massive lead on Ray, and even leaped past IanW and JohnM, putting me in 5th place behind that BFG, Fran. I'm 286 points away from my revised target (which is double my original target). 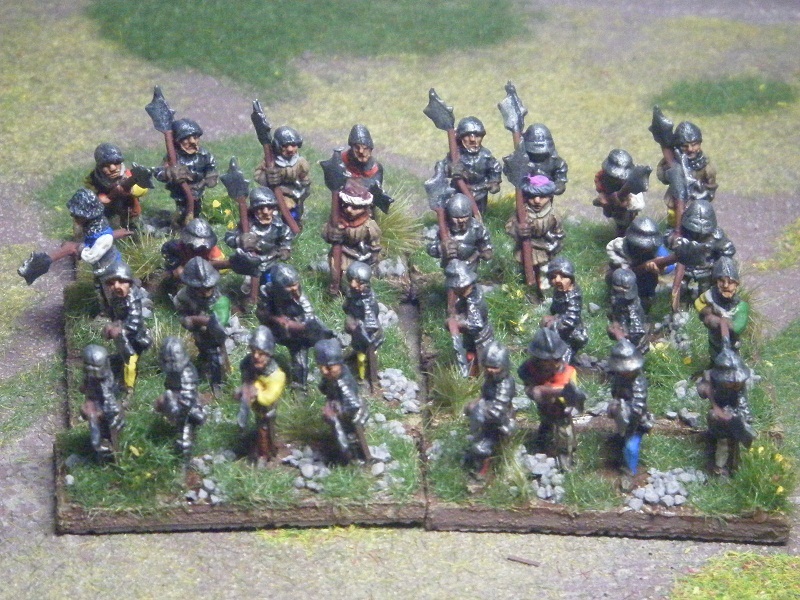 Can I paint up 143 Swiss infantry in the next 22 days? It's going to be a tough job to do that, but I'll definitely give it a good stab. 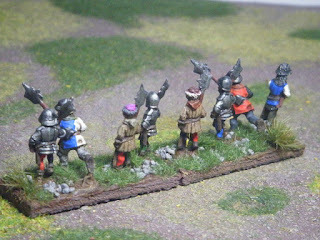 The crossbowmen, handgunners and artillery I prepped yesterday have been primed with gesso. 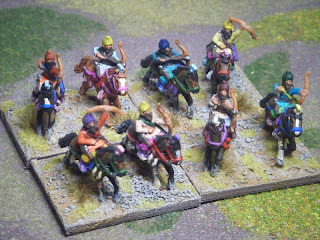 This evening I've been prepping some more figures and will probably continue to do so for the rest of this week in the evenings. 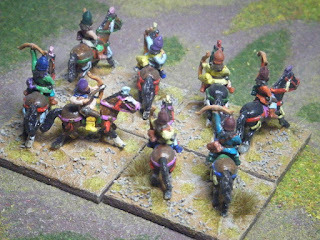 My planned Saga game(s) at the club tonight suffered a setback - I woke up this morning with another grotty cold! 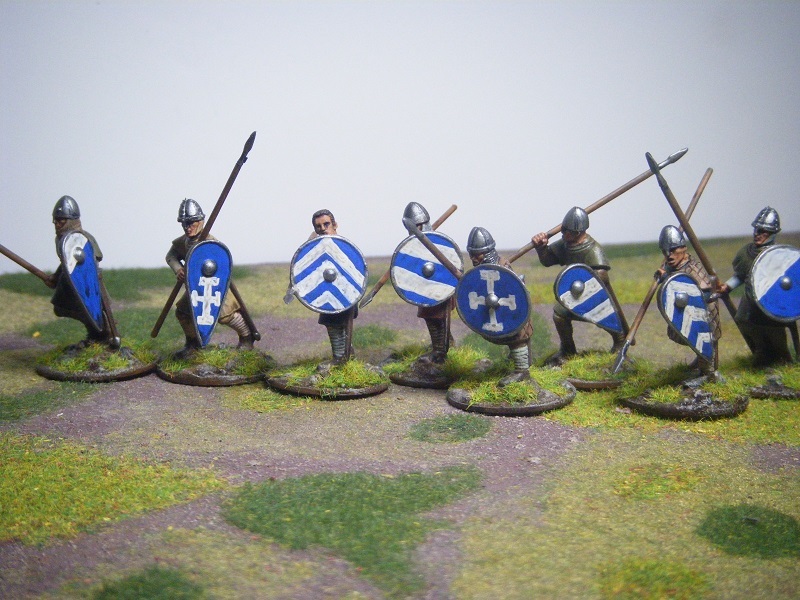 Having taken Thursday and Friday night off from painting, I finished the first 12 of the Norman infantry (2 warlords, 2 bannermen and 8 "knights" on foot) yesterday. I was in two minds whether to wait until I'd finished the whole lot and submit them together or to send them in as two entries. And then I noticed that my next entry would be the 12th and it seemed appropriate to send in 12 figures for that, so I did. Hopefully the pics will go up on Curt's blog this evening. 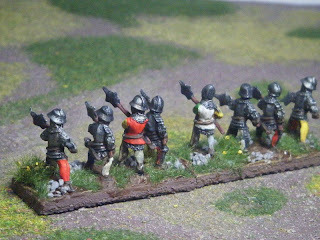 I cracked on and finished painting the other 32 figures yesterday, then matt-sprayed and flocked them this morning. I've sent Curt the pics of these as my 13th entry. Right now I haven't got any figures ready for painting (well, I do have some Swiss pikemen, but I'm waiting for those 23 figures I forgot to order to arrive). So, this afternoon I decided to prep some of the other Swiss in my recent big order - 24 crossbowmen, 24 handgunners, 12 artillery crew, 4 artillery pieces and some bits and bobs. They are currently being washed in warm soapy water. Later on I'll rinse and dry them. I might be able to put them on painting sticks and prime them tonight if things go well. 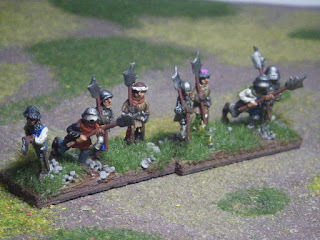 I will start prepping the pikemen I do have though, so that I can make a quick start on them once the missing 23 arrive. If I've got them prepped and primed by the time I finish the artillery and skirmishers, I'll be able to make a start on these bad boys. I might do them one rank at a time. I'll also be base-coating a bunch of bases this evening and over the course of the week. I won't be getting any/much painting done tomorrow as I'm going to the club to play Saga - the first outing for my Norms. 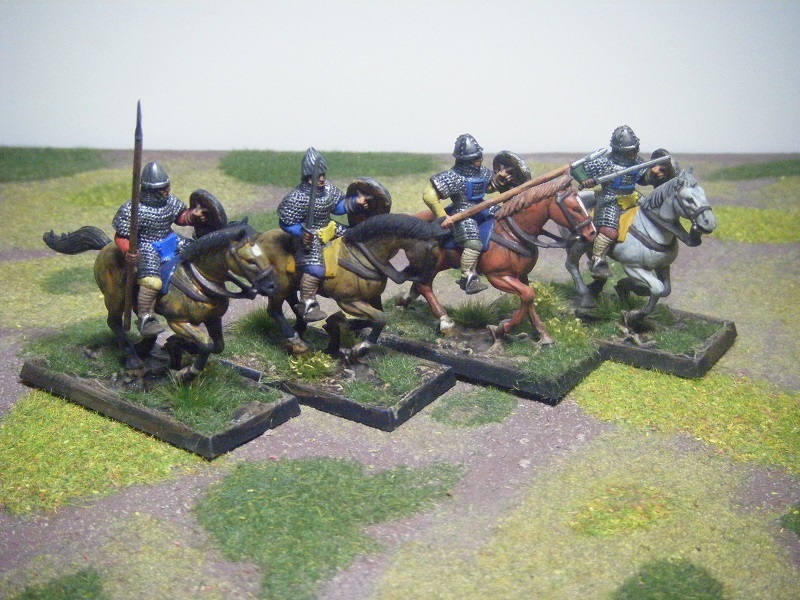 I've finished painting the warlords, bannermen and mailed infantry and they have had their coat of Klear/ink. 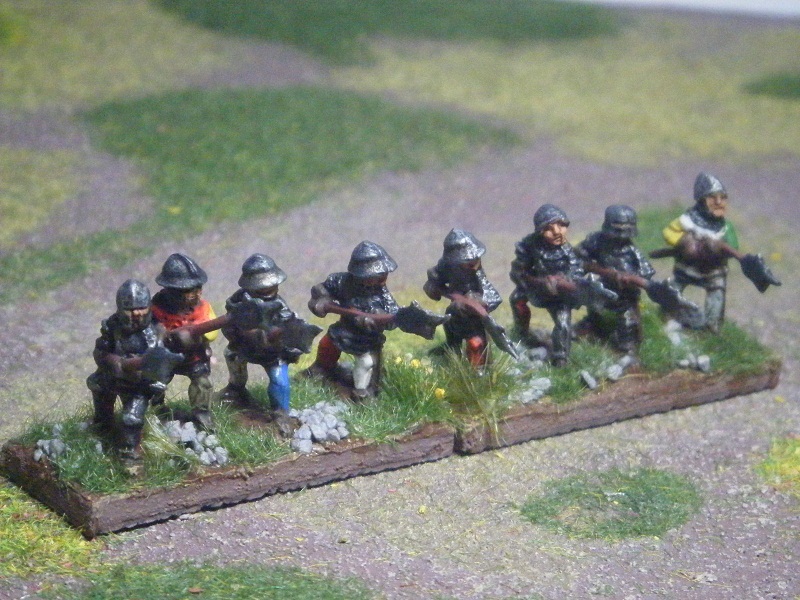 I've also made good progress on painting the 8 infantry in gambesons and the 24 without any armour. If I'm lucky, I'll have got everything done on these apart from the shield designs by the end of tonight. These should have allowed me to jump ahead of Ray, but he'd sent in a batch as well, so is still 2 points ahead of me. Grrr! 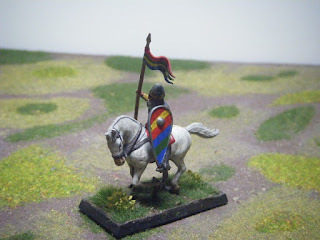 I'm hoping that my Norman infantry will give me a good lead on him which I can maintain! 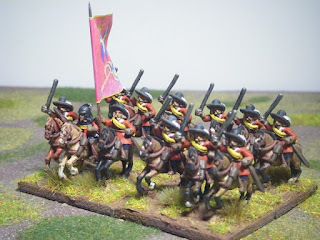 Curt posted these yesterday, but here they are on my blog for you pleasure. First up, a unit of 12 Harquebusiers. Next up, "Hack them all!". 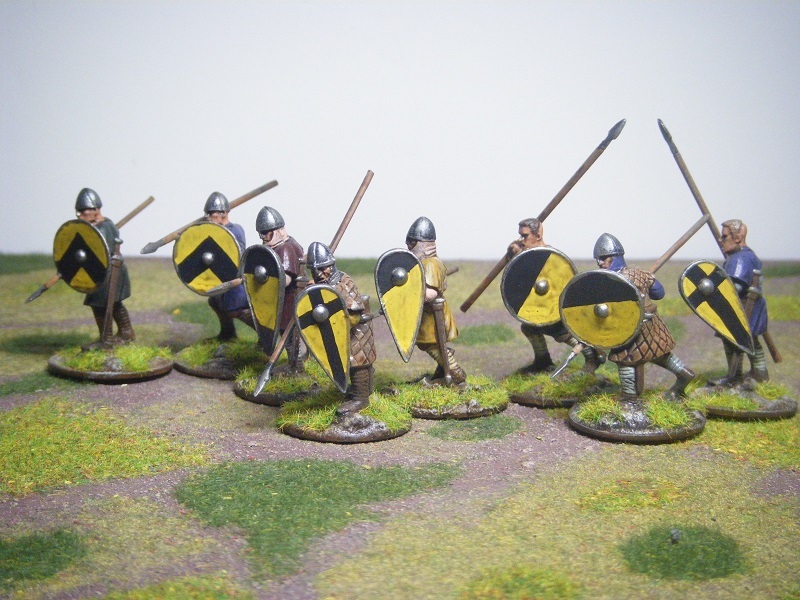 Yes, the dreaded "Hakkapeliita" of the Swedish army. These were Finnish cavalry, whose name comes from their battle cry "Hakka pella" which means "Hack them all! ", not a threat to sing without musical accompaniment. 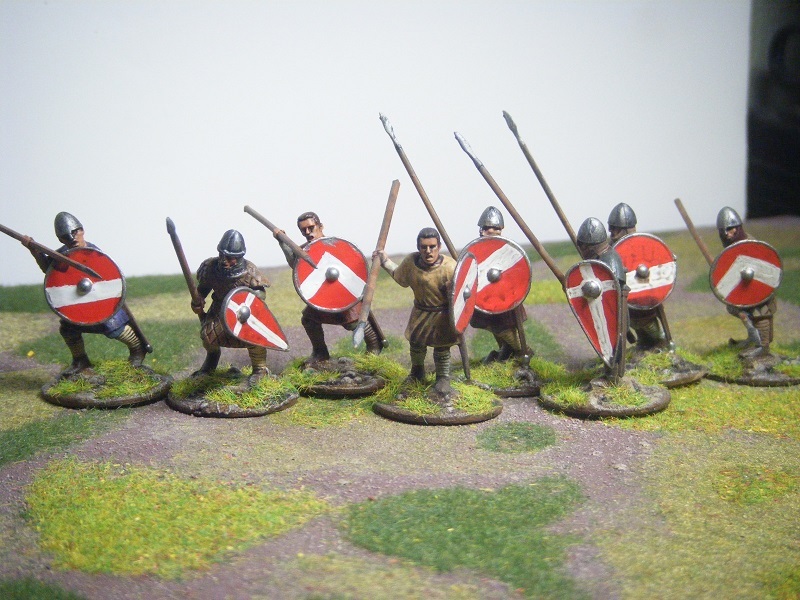 They gained a fearsome reputation on the battlefields around the Baltic. The regiment had its origins in the Nyland knights which became the Nyland and Tavestas Cavalry Regiment in 1629 under Lt Colonel Torsten Stalhandske. 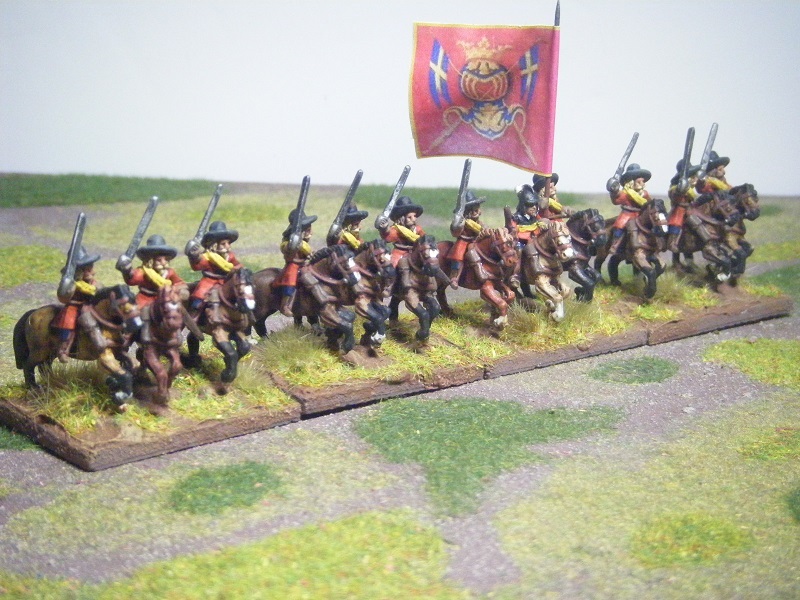 At the battle of Breitenfeld (1631) they were on the right wing of the Swedish army and were commanded personally by Gustav Adolf. The flag is homemade. 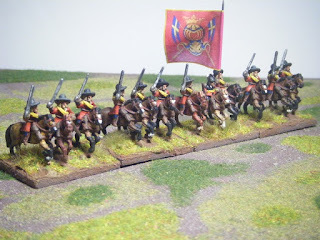 I had trouble finding the flag they used in the 30YW - I think this one is from late 17th/early 18th century, but it probably hadn't changed greatly in that time. 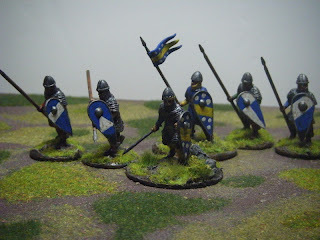 Surveying an Old School for Updates of Norman Knights? Phew, that's a rather long and possibly confusing post title for you! 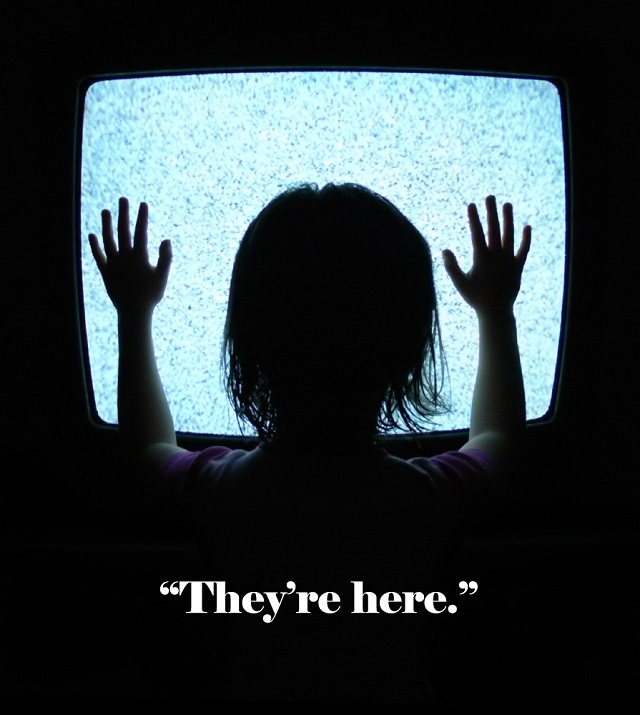 To explain, it's because there are 4 topics to today's post. Mike Whitaker of Trouble At T'Mill posted this the other day. A student at Kings College London has put a survey about wargaming up on the web for part of his thesis. If you can spare 20-30 minutes to fill out the survey, that would be great. 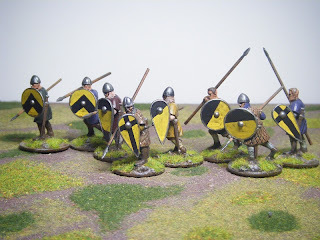 An interesting post on Steve's Random Musings about what defines "Old School" wargamers. 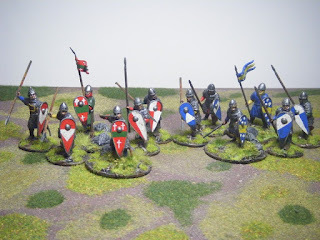 This follows some of the comments and speculation surrounding the news that Miniature Wargames and Battlegames are to merge with Henry Hyde as editor. I subscribe to both magazines for different reasons. 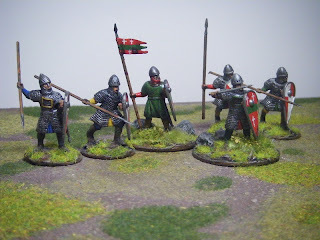 MW is great for colour pics and eye candy; BG is good for the more practical side of gaming - articles on painting and terrain making, tabletop tactics and suchlike. Combining the best of both into one magazine makes a great deal of sense. 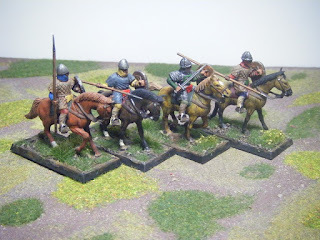 There have been numerous comments about BG being all about "old school" wargaming. Taking a flick through the last 7 issues, there are only 2 or 3 articles (out of about 70) where there is anything specifically old school, but even there it is only that they happened to have used old school type rules - the games in question could just have easily been conducted under "new school" rules. So, what is "old school" and is it something we should tolerate politely like an embarrassing relative or something we should embrace? 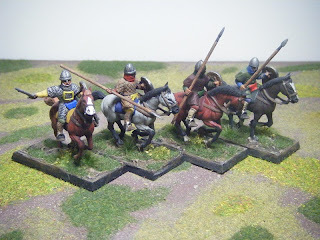 I think of old school as being the willingness to research the period and armies, write (or adapt) rules that reflect the warfare of the period without being overly complex and which result in good fun social games. There's nothing at all wrong with that. If anything it is something we should all try to live up to. 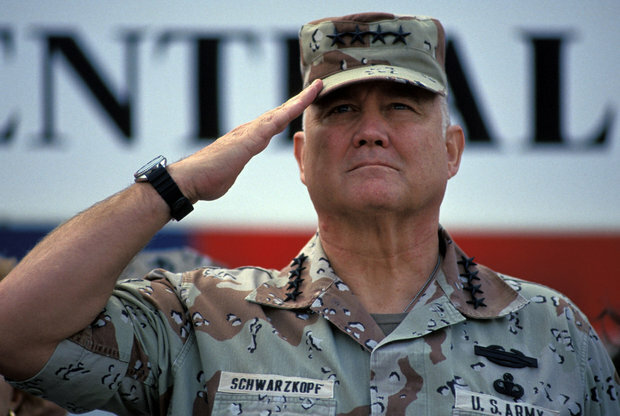 Does it preclude enjoying the fancy new rules with the latest gimmick for simulating a particular aspect of warfare? Absolutely not. There are others worried about what will happen to SciFi and Fantasy coverage in MW under Henry. Looking at the last 7 issues of BG again (and knowing Henry's own eclectic tastes in gaming) there are two quite long scenarios in the Sci/Fant sphere. I'd say that if anything, Sci/Fant will be even better served in the merged mag. 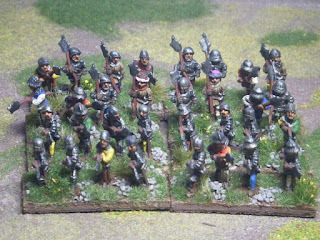 The reiters/harquebusiers and Hakkapeliita are finished and the pics have been sent off to Curt. I'm hoping that they'll go up tonight so that I can swap places with Ray and be in 7th place on the table. Of ciurse, that assumes that he hasn't sent something in as well! 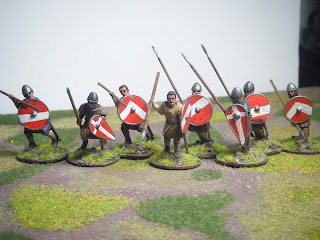 Basecoats - clothing and shield faces in yellow ochre; spear shafts in cork brown; flesh and shield backs in light brown; gambesons (8 figures) in tan earth. 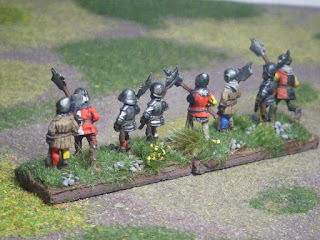 All the above areas apart from yellow ochre received a brown ink wash. I then got on with the mailed "hearthguard" and command figures as they would have the bright colours for clothing. 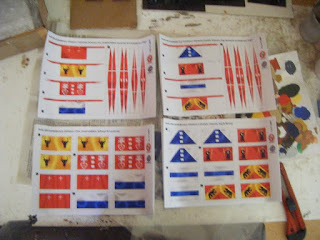 I got pretty much everything done above the knee, including the shield designs. Tonight I'll be doing dark washes on the cloth for these, then working from the knees down to (hopefully) finish them. Tomorrow I'll be able to get going on the other 32 figures. 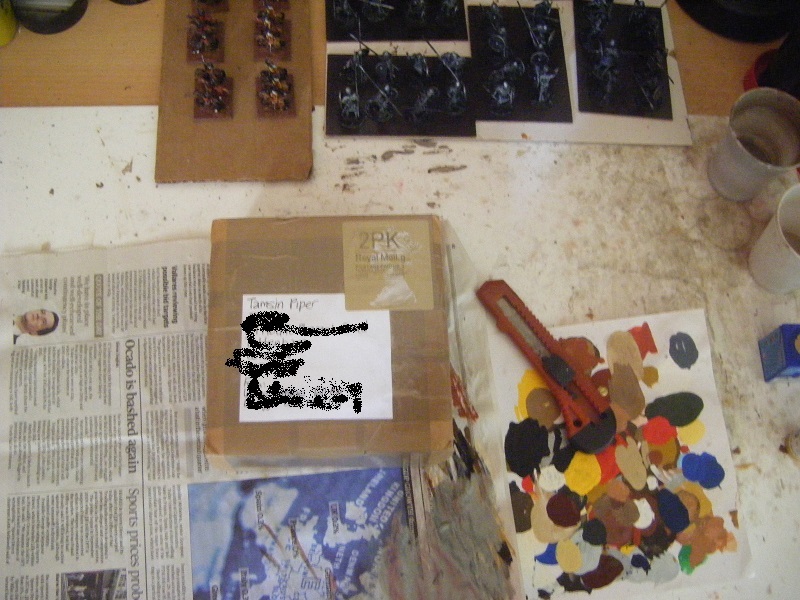 You can see the pics and blurb here on Curt's blog, but I'll show the pics here. These earned me 187 points which would have been enough to jump past Ray and Fran on the table. However, they'd also sent stuff in so I'm still behind them - not far behind Ray, but Fran's submission scored him a whopping 444 points so I don't think I've got any chance of catching him. It's nice to be off work for a couple of days! It would be even nicer if it was three whole days, but I got persuaded/cajoled/briber to sit on a grievance appeal panel tomorrow afternoon which breaks up my little break. 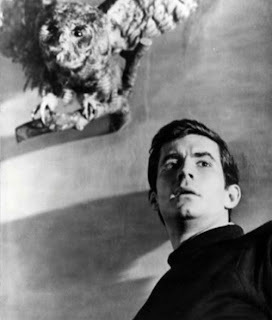 Anyway, shortly after getting up the postman rang the bell for my flat. 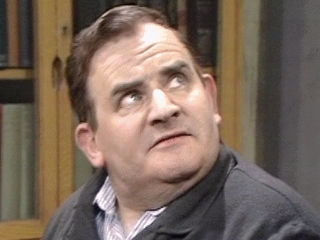 "ooooh, a small parcel! I wonder what this could be?" Yup, my order to finish off my Swiss army has arrived. On checking through the packs and doing some sorting I discovered that I'd made a booboo when placing the order. Instead of ordering 24 of one code I'd only ordered 1! 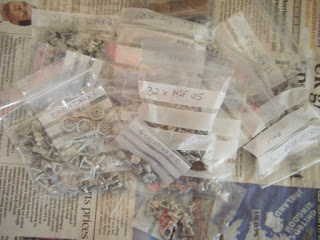 Zoiks, I'll have to place another order for the 23 I'm missing! So, if you're really unlucky you might be seeing a whole load of Swiss being rapidly painted and entered in the Challenge! As I'll have to wait a few days at least for the pikemen I messed up the order for to arrive, I might make a start on the command stands, artillery and skirmishers. My old laptop died overnight. She had had a good, long life (just short of 5 years) and was past due for retirement and replacement by a younger model. Luckily I'd been forewarned by her reluctance to boot up yesterday, so had backed up my files to an external drive. Now I've just got to get used to the keyboard on the new one. 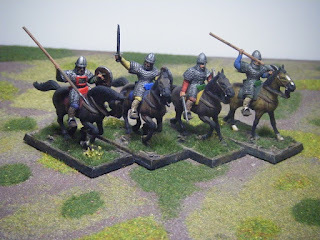 Well, the knights are finished and pics have been sent to Curt, so hopefully they'll go up on his blog tonight so I can post them here tomorrow. 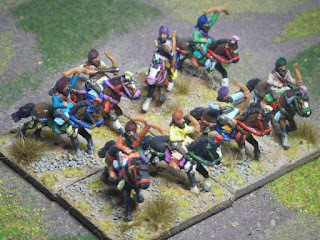 I'd finished painting them on Thursday and glued the riders to their horses. 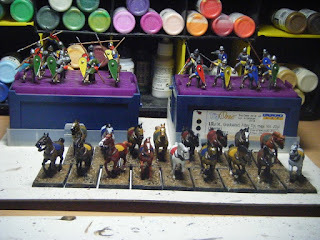 Last night I did the Klear/ink coat and today I sprayed them with matt varnish then tufted and flocked them. I need to order some 20x40mm steel bases to go underneath to allow me to transport them in boxes lined with magnetic sheet. That can wait a little while though. 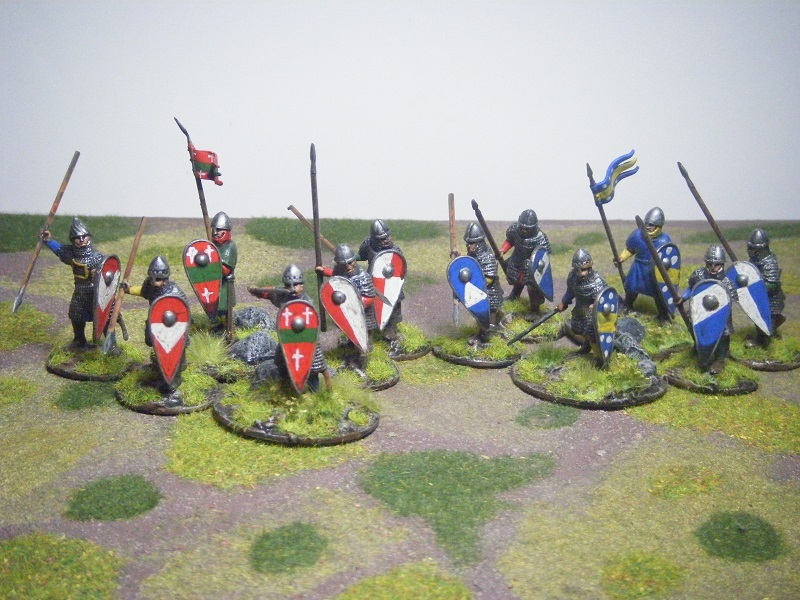 So, the entry consists of 17 Conquest Games 28mm plastic Norman knights with hand-painted shields and pennant. That should give me a comfortable margin over my original target for the Challenge and a good boost towards my new target. 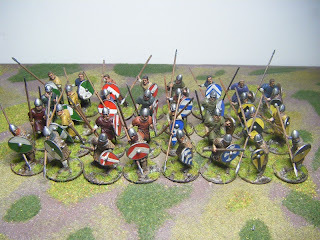 With the Norman knights done, my evening was clear yesterday but I didn't fancy starting on the Norman infantry. 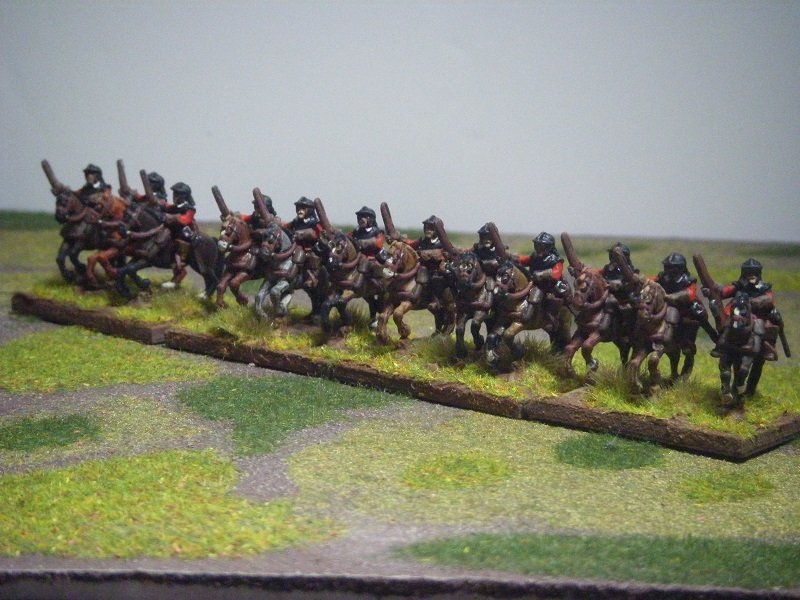 Instead I decided to make a start on the Hakkapeliita and the Reiters. 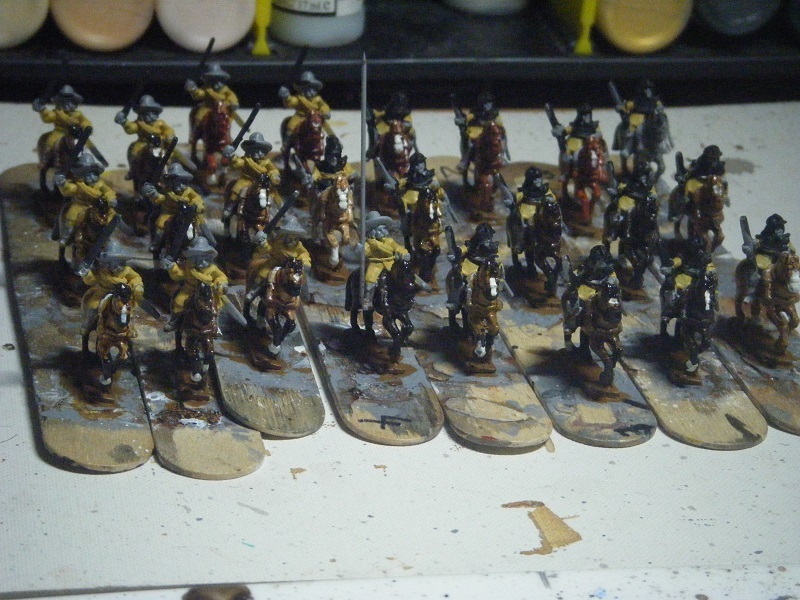 I got the horses almost finished and the undercoats on the riders' jackets and metalwork. This evening I've cracked on some more. 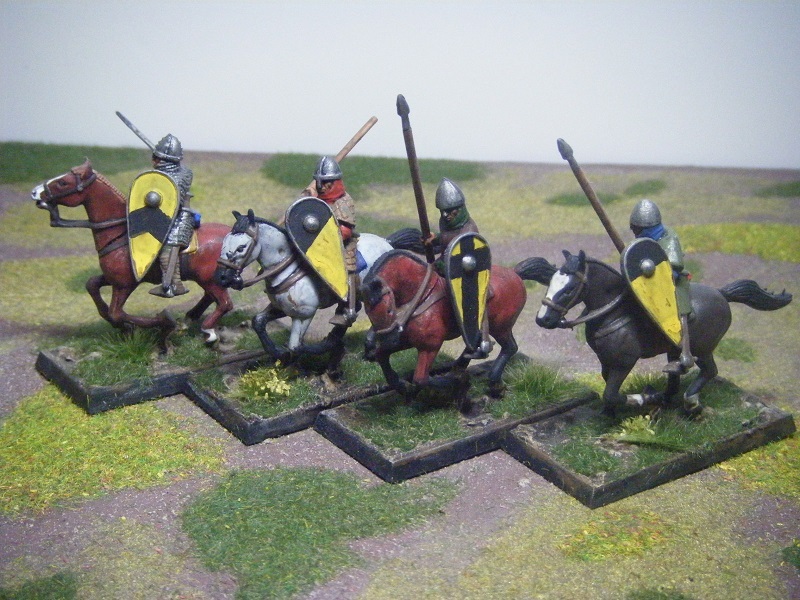 I've managed, so far, to drybrush the metalwork (armour, sword blades, pistol/carbine barrels) and have painted the tack, saddle-cloths, faces, trousers and jackets. and the pistol and carbine stocks and the flagpole. If I'm really lucky, I'll be able to finish painting these tomorrow, which should mean I can enter them in the Challenge on Monday! 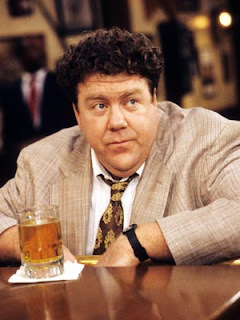 It seems you all enjoyed my post the other day, so here are 2 more pics of "Norms"
When I saw Ray's comment this was the first pic I thought of adding, but when I got round to writing the post I'd completely forgotten it and just did the other Norms. Oh well, better late than never! 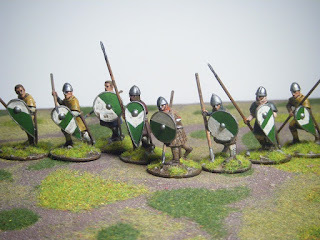 Oh, it was Normans he wanted to see? Oh well, he'll just have to wait. The Normans are progressing nicely. I actually managed to do all the steps I'd intended last night, so there's a very good chance I'll have finished and submitted them before the weekend. 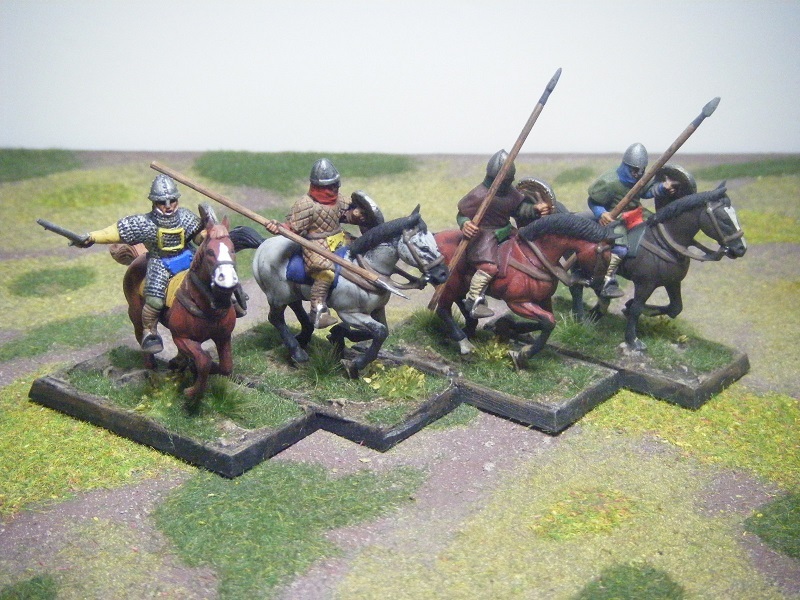 Tonight I'll be finishing off the horses. I've already done the horseshoes where they are visible and done the basecoat on the "ground". 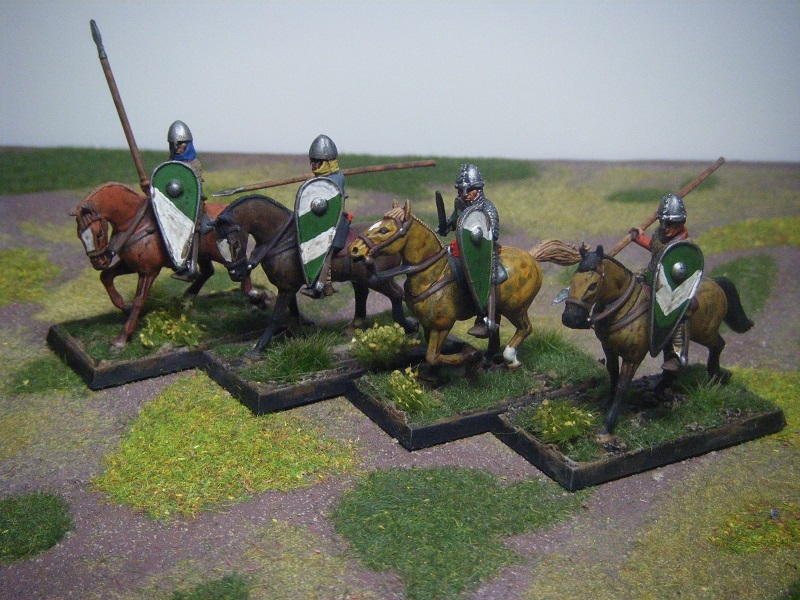 I'll be doing the rest of the basing texture and hopefully the metalwork on the bridles. Just a quick progress report as I didn't post yesterday. 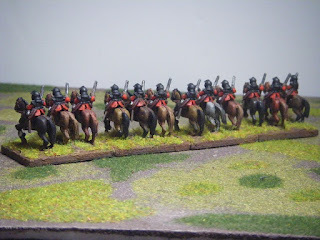 I managed to prime them all on Saturday night, then dry-brushed them with Sky Grey yesterday morning to provide pre-highlighting. Thank goodness that's done! 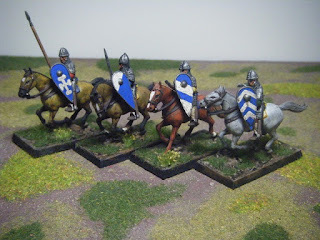 I've started work on the knights. 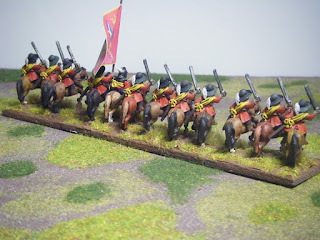 the horses have had their base colours applied and their washes. 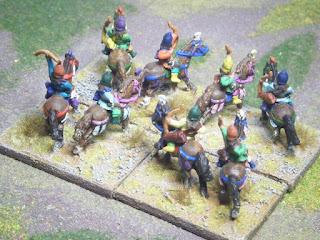 The riders have been dry-brushed with Oily Steel on the metal work (helmets, blades, chain mail, shield rims and bosses). The shield faces were then undercoated with Yellow Ochre and base coats applied (Dark Blue, Flat Green, Vermillion, Flat Yellow). I'm hoping to get backs of shields, spear/lance shafts and flesh done this evening for the riders and hopefully to get markings, hooves, tack and saddle cloths done for the horses as well. 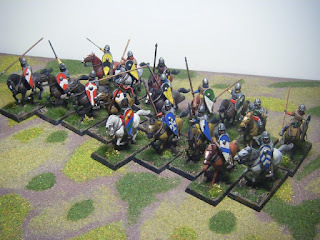 The infantry will just have to wait until the knights are done! Having left these in warm soapy water overnight, yesterday they were rinsed and left to dry. 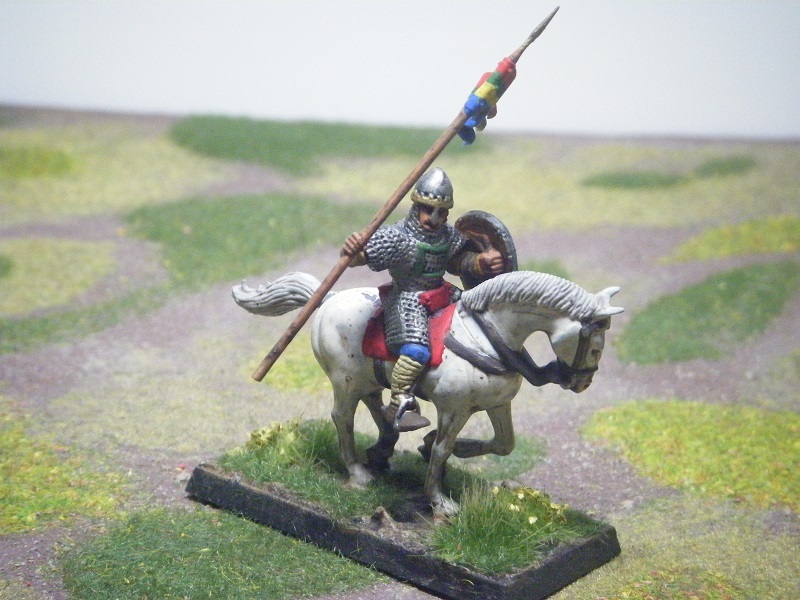 Since then I have glued horses onto painting sticks, attached the riders with superglue (and fitted a lance/flag-staff to one of the Hakkapeliita - I'd removed his sword and drilled out his hand during the prep) and primed them with gesso. 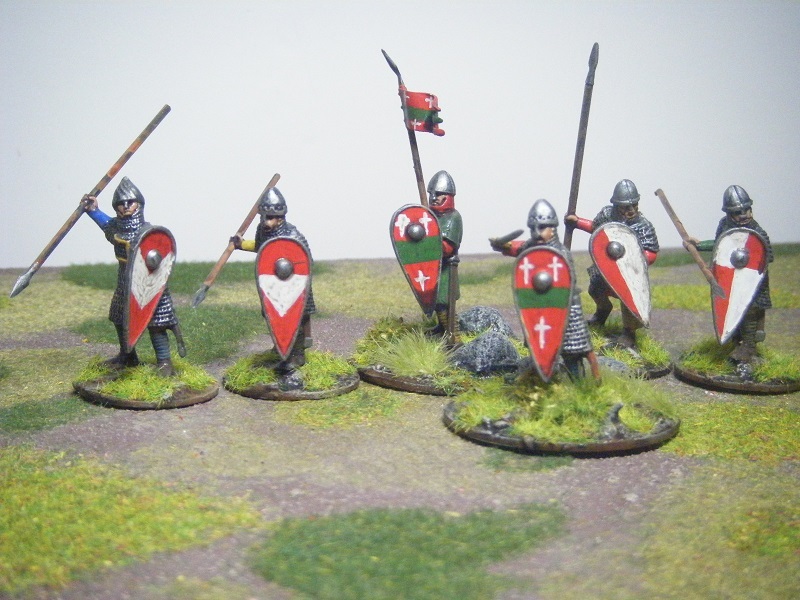 I'll probably paint one of these up between doing the Norman knights and the first half of the Norman infantry. A bit of a busy post today! I am still a Space Marine! The good news is that Amazon have relented and reinstated the Kindle edition of Spots the Space Marine on their stores (the print version was never dropped as far as I am aware). My 9th entry consisted of 24 Scythian light horsemen. 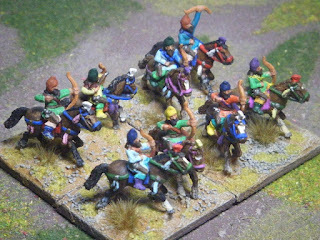 Unfortunately only the riders counted as I'd started work on the horses prior to the Challenge. These figures didn't seem to have as much "texture" as other sculpts from Donnington, which meant that the Klear/ink coat didn't provide as much definition as normal. 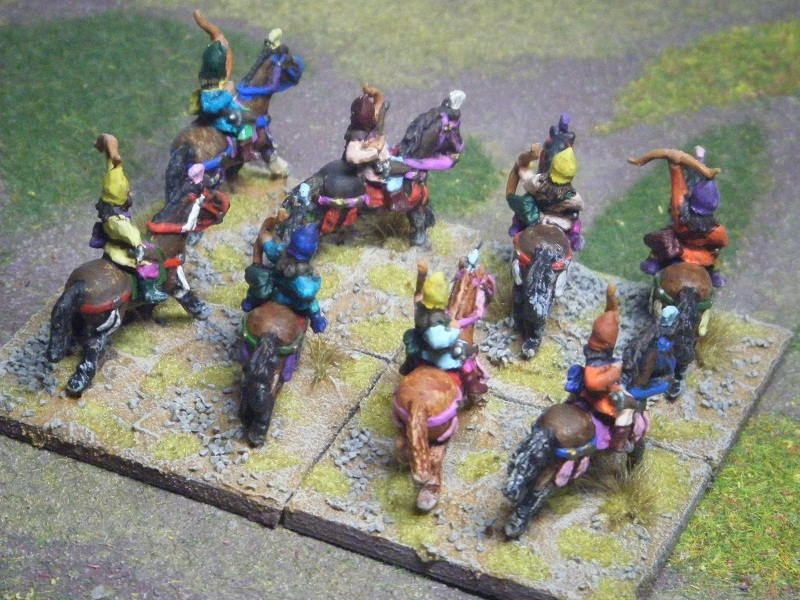 So, here you go - 24 very colourful Scythians. 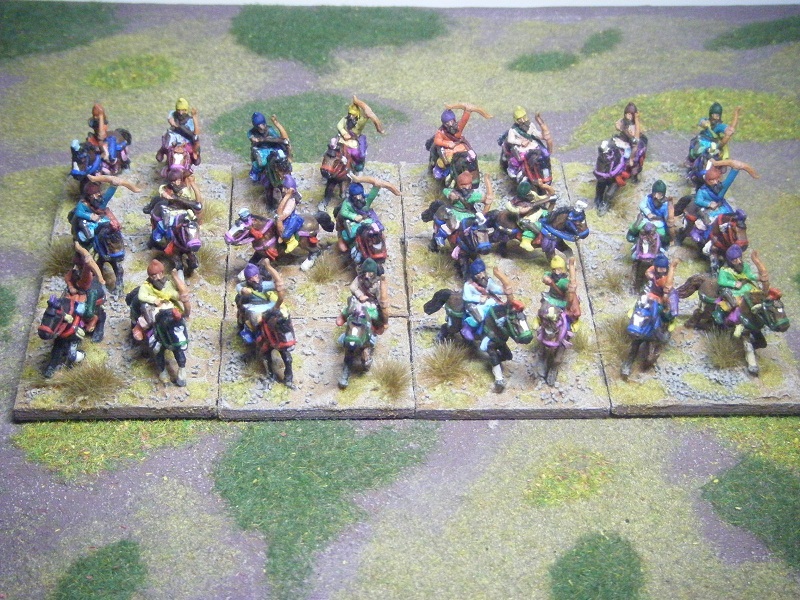 At some point (probably after the Challenge) I'll finish off the rest of my Scythian allies contingent for FoG. A quick pic to show you what I'm working on right now. 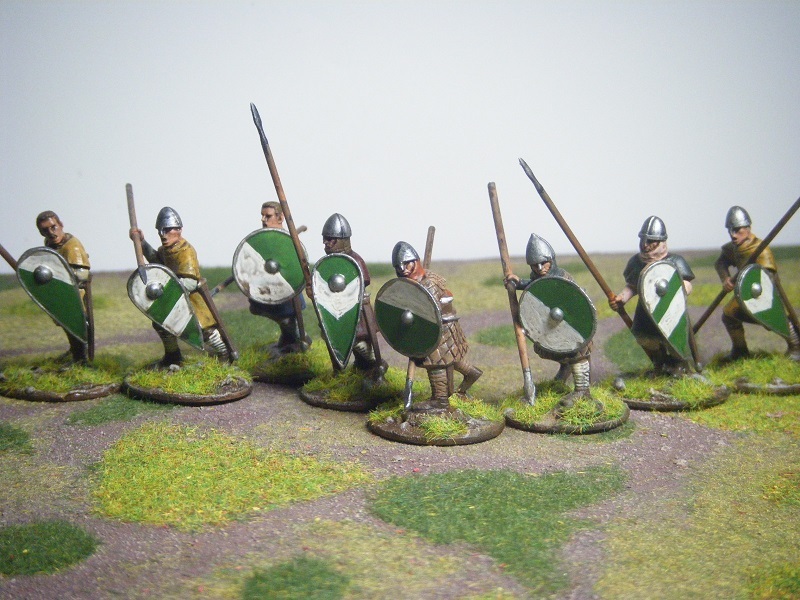 Yup, 28mm plastic Normans from Conquest Games. There are 17 mounted "knights" and 44 infantry. 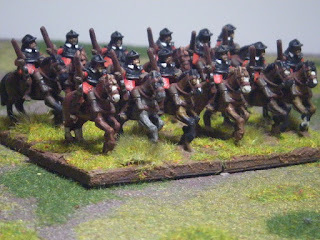 It's taken me a couple of evenings to prep and assemble them, plus a couple of hours today to add the basing gunk. This evening I'll hopefully be able to prime them and maybe do the pre-highlighting (dry-brush with Iraqi Sand). 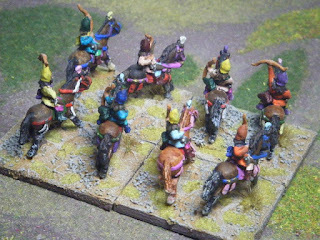 I did the assembly of the riders on the horses, held in place with a drop of rubber cement, then removed them and superglued them onto nails so that I can paint the horses and riders separately. While I'm waiting for the basing gunk to dry, my plan is to prep some more 15mm 30YW cavalry - 12 harquebusiers/reiters and my 12 Hakkapelliita. That way if I get bored painting 28mm Nomrans I'll have something to switch to to keep the mojo going. You may (or not) be aware that those craptastic shysters of the Evil Empire Of Nottingham are up to their dirty tricks again. This time, they have bullied Amazon into dropping MCA Hogarth's "Spots the Space Marine" from their e-book listing on the grounds that they own the trademark to "Space Marine" in published fiction. This is despite the fact (easily confirmed by reading this Wikipedia entry) that the term has been used in literary science fiction since 1932 at least. As a self-published author, MCA Hogarth can't afford the legal fees to fight the case in the courts. The big danger is that by not contesting their claim, it could set a precedent for when they try it again. I AM A SPACE MARINE!!! My 9th entry has been submitted - the Scythian light horsemen. As I'd started painting the horses before the Challenge, only the riders will count towards my score but that's still 48 points. 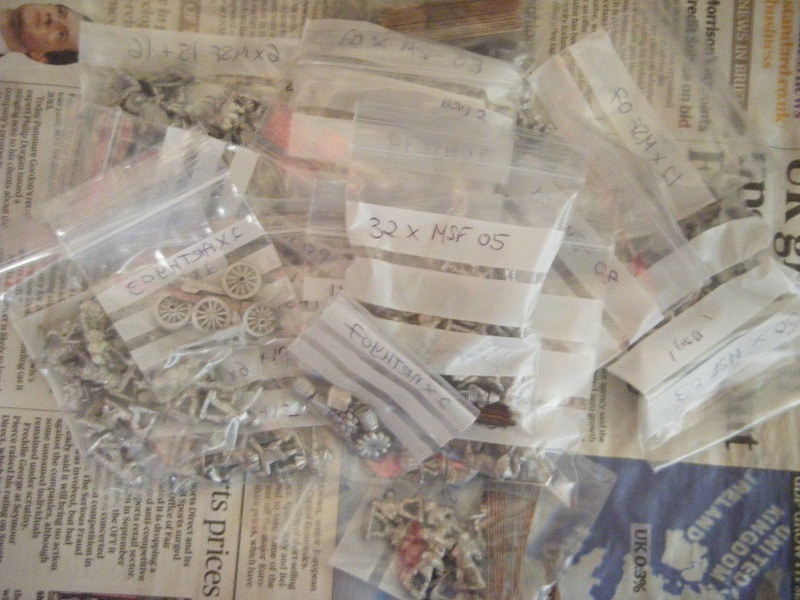 However, I've now not got anything ready to paint, so it's assembly time. I'm in the process of assembling some 28mm plastic Normans from Conquest Games - 17 knights and 44 infantry. 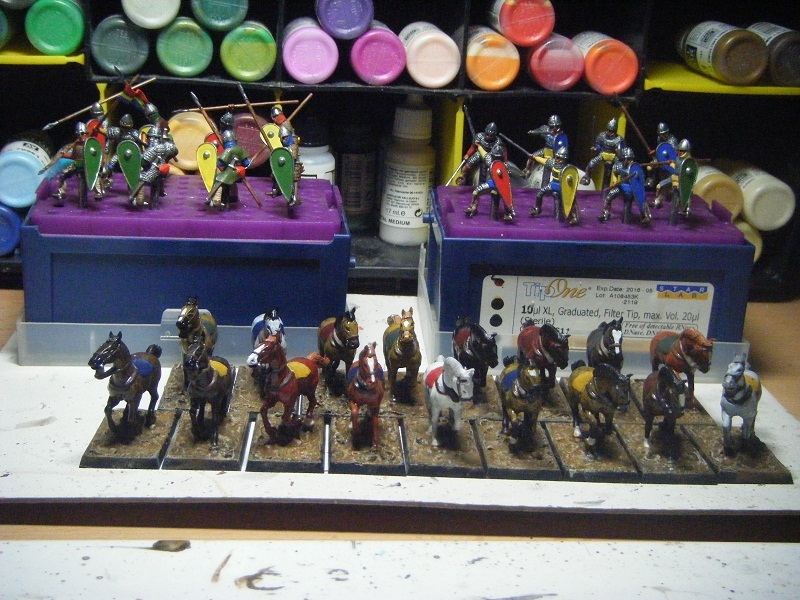 So far I've assembled the 17 horses and cut all the bits off their sprues. I've also raided some of the infantry sprues - the kite shields on the knights sprues don't have bosses, but this was corrected for the infantry. 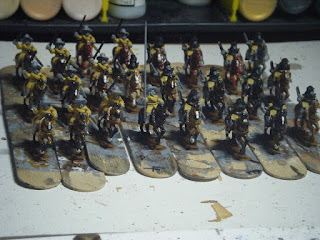 All this assembly is likely to take me a few days, so it will be at least a week before any more figures are finished. I can see Ray extending his lead by a huge amount by then. My 8th entry in Curt's Challenge was the first of my Swiss heavy foot - 32 halberdiers. As you will notice from the link, my "blurb" was rather heavy with innuendo. I must have been in a rather silly mood when I wrote it. My next entry is almost done. 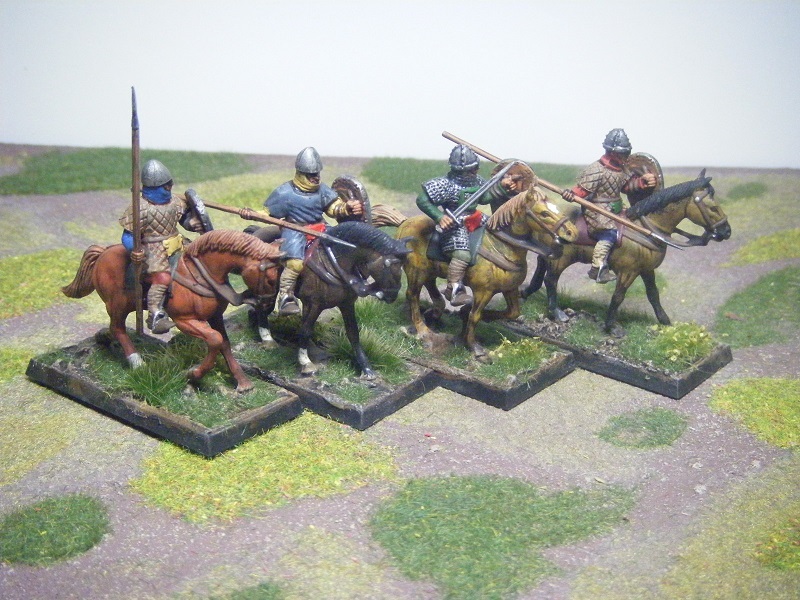 I've finished painting the Scythian light horse and they have just received their Klear/ink coat. I should be able to get them based before going to bed, which might allow me to finish them tomorrow, but it could be Thursday that they get finished. 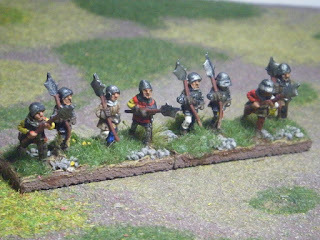 What a strapping bunch of young men from the Alps they are too. 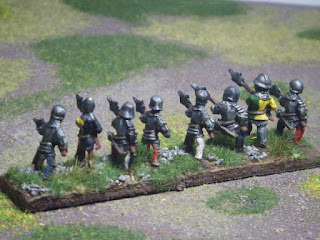 Figures are from Donnington and their colours represent all of the cantons present at Morat (and probably Grandson as well).